Do you dream of even, all-encompassing warmth throughout your house? If so, maybe it's time to turn to a highly efficient system that can keep your family toasty warm all winter long, no matter where in the house they happen to be. It’s the 21st century! It shouldn’t be such a struggle for owners to heat their homes evenly enough to enjoy total comfort and efficiently enough to achieve low energy costs. But still, even today, those hot and cool spots that are the hallmark of inconsistent home climate control continue to plague us. Sometimes it’s an issue of insulation. Other times the blame goes to improper window installation. But in the case of many multi-story homes, winter discomfort often stems directly from the hit-or-miss operation of an increasingly outmoded HVAC technology. Forced air—the dominant heating technology since the postwar period—certainly comes with some redeeming qualities. But in single-zone applications, its normal operation inevitably leads to an unwanted result. During system operation, while the ground floor of the home remains stubbornly chilly, the upper-level rooms become unpleasantly warm. Additionally, for homes with vaulted ceilings, much of that heat is wasted. Making matters worse, in the course of its ultimately futile attempt to normalize temperatures, forced air devours energy and drives up the utility bill. The good news? Thanks to staggering advances in technology, forced air isn’t the only option anymore. To understand why forced air often fails to create uniform conditions, you first need to know how the system works. It all starts with the thermostat. As soon as the thermostat registers that the temperature has fallen below a certain threshold point, the system kicks on, blowing furnace-heated air through supply ducts and into the living spaces. Once the target temperature has been reached, the heat turns off. Here’s the trouble: Not only does comfort depend largely on proximity to the nearest air vent, but there’s also the pesky fact that heated air rises—at least until it hits a barrier, such as attic insulation. As the heat heads upward, temperatures in the home stratify. Soon, the thermostat senses a lower temperature downstairs, which triggers the forced-air system to snap back on. In this way, the cycle repeats over and over, never resolving the fundamental problem of uneven heating. Plus, further exacerbating homeowner discomfort, the forced-air system’s constant on-off cycling leads to dramatic temperature swings. Taken together, the shortcomings of the technology ensure that when there is comfort, it comes only to certain areas and only temporarily. You’d think that climate control so frustratingly inconsistent would at least be economical. But perhaps no other HVAC system has done more to reinforce the perception that heating the home and saving energy dollars are mutually exclusive propositions. Why does it cost a small fortune to run a forced-air system from one winter month to the next? To a large extent, forced-air heating tends to consume more energy than strictly necessary because heat loss undermines its efficiency. Of course, heat loss isn’t uncommon. In fact, it’s present in all homes, no matter their heating setup. The distinction is that in homes with forced air, heat loss occurs within the HVAC system itself—in the ductwork, most of all. Though vital to the operation of any conventional forced-air system, ducts have earned a reputation for being leaky. Even if the air leakage occurs only at the joints where two sections of ducting connect, it can be enough to compromise overall efficiency by 25 percent or more. To make up for the heat loss, the furnace must work harder and consume more energy. Essentially, homeowners must pay extra to correct a fundamental flaw of the system. Like so many other technologies, HVAC has improved by leaps and bounds in recent years. Today, homeowners enjoy an array of options designed to deliver where conventional forced air falls short. At the top of the “most intriguing” list? Radiant heating. There’s a popular misconception that “heated floors” are nothing more than a frivolous luxury for high-end bathrooms. But while it’s true that some radiant heating products are designed to be merely supplemental, others offer a viable means of heating the whole house. 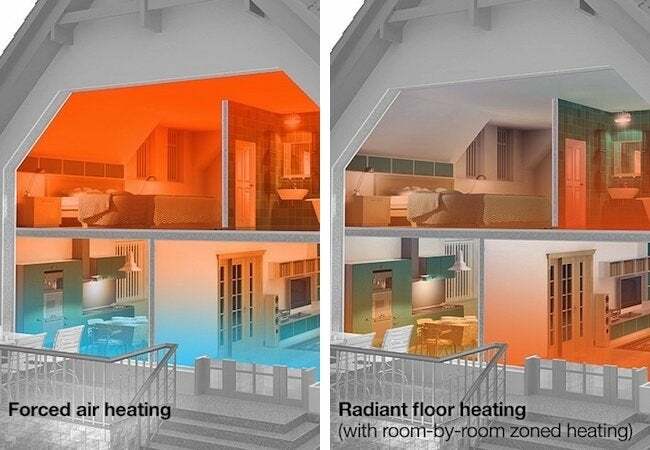 Even better: With its unconventional, innovative approach, radiant technology actually manages to solve the uneven-heating issue that has frustrated homeowners for decades. How exactly? Because radiant-heat panels are installed beneath the floor, they deliver warmth silently and evenly across virtually every square inch of space, ensuring encompassing, “everywhere” comfort, no matter where you travel in your home. There are no uncomfortable temperature swings, and the in-floor technology concentrates heat not in the air above you—not near the ceiling or in the upstairs rooms—but at the level where you need it the most and can most readily feel it. Whereas circulating air delivers the heat in a forced-air system, it’s water that does the job in a hydronic radiant setup. From the boiler, the water gets pumped through a network of tubes set into special panels under the floor. The water transfers heat to the panels, which then radiate heat to the floor and on to the people and furniture in the space. Along the way, in contrast to forced air, a radiant system undergoes minimal heat loss. For that reason, even as it creates much more comfortable conditions, radiant heat consumes much less energy. In fact, it’s at least 25 percent more efficient! That said, materials matter when it comes to the efficiency of a given radiant system. Take the Warmboard system, for instance. Its panels are made not with the more standard gypsum concrete, but with aluminum—a material that conducts heat 232 times better. That enables the Warmboard system to operate using substantially less energy than others. So, while you can save with any radiant-heating system, certain systems can save you even more, thanks to their ingenious design. Although it’s already widespread in Europe and Asia, radiant heating hasn’t yet taken off in the United States. But that’s been changing, as homeowners learn about the technology’s many advantages. 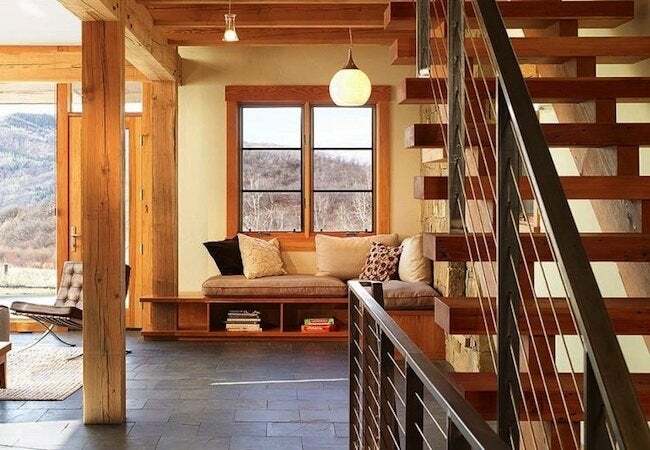 In addition to sidestepping the all-too-common issue of stratification—too little heat downstairs, too much upstairs—radiant heating also offers a range of other performance benefits. For example, while traditional heating systems very often make a racket, radiant heating runs all but silently. In addition, radiant heat helps maintain healthy indoor air quality, because the technology operates without dust- and germ-spreading ductwork. Of course, installing or upgrading an HVAC system usually entails a number of important considerations, many quite sophisticated and complex. But in the end, the appeal of radiant heating couldn’t be simpler. The technology delivers a qualitatively different climate-control experience—even, all-encompassing, “everywhere” warmth—while consuming less energy and eating up fewer energy dollars.